CCG NHS GP's pushing for the UK Government to go ahead with NHS reforms that would effectively transfer an annual NHS commissioning budget of at least £80 billion into the hands of GP led consortia's across the country, have gone on the offensive in the mainstream press as illustrated by across the media sphere articles of the NHS being in peril if government health reforms fail to go ahead. In a letter to The Daily Telegraph, the heads of more than 50 new doctors' groups argue that the British Medical Association's policy of "blanket opposition" to the Health and Social Care Bill fails to represent GPs' views. They warn that previous reforms have not gone far enough and have consequently "paid the price of disengaging the frontline staff most needed to modernise the NHS". They argue: "We cannot allow that to happen this time. Without strong clinical leadership and the co-ordinated efforts of local clinicians the NHS itself may be in peril: local services can only be improved if we all pull together." The letter has been signed by 56 GPs who are helping set up clinical commissioning groups (CCGs) across England. Under the Bill these will effectively replace primary care trusts (PCTs) and be handed their budgets. Andrew Lansley, the Health Secretary, has consistently argued that the central thrust of the Bill is to give doctors a greater say, and key to this is giving them more responsibility for commissioning health services. 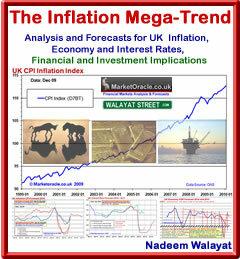 The government reforms are fundamentally flawed as I have been illustrating at length since they were first announced over 18 months ago in June 2010 (09 Jul 2010 - ConLib Government to Give NHS GP's £80 Billion Blank Cheque), and which the mainstream press has only been becoming aware of to limited extent during 2011. The problem at the root of the NHS is that the government reforms of letting private sector firms take up GP practice delivery is the lack of a market for patients, and not for services. For if there is no real competition between surgeries and other providers for patients then the patient will NOT come first no matter who is delivering the service. The core at the heart of Coalition Government's NHS reforms is to scrap ALL NHS Primary Care Trusts (PCT's) to be replaced by competing GP Consortia's to directly manage patient treatment commissioning. Unfortunately whilst the propaganda is of better value for money by means of competing consortia's, however the implementation of the reforms is proving to result in the exact opposite anti-competitive consortia's, as virtually all of the Sheffield NHS 92 GP Practices have signed up with one of of 4 geographically located GP Consortia's. The flaw in the construct of the consortia's is that there is nothing to suggest that the consortia's and GP surgeries will be competing for patients which therefore means the governments planned reforms will fail and patients could end up with even worse health services as GP surgeries will be wielding greater power within their geographic constructed Consortia's then they were able to wield under the city wide Primary Care Trust, therefore no competition in GP services will exist and the governments reforms are destined to fail just as badly as Labours 2002-2003 GP contracts failed as they sent annual GP pay rises soaring into the stratosphere, culminating in pay rises of more than 30% per annum. The Coalition Governments NHS reforms to scrap ALL NHS Primary Care Trusts and replaced by competing GP Consortia's to directly manage the £85 billion budget for patient treatment commissioning, looks set to be heading for a complete disaster on the scale of the last Labour governments GP Contracts disaster, as GP Consortia's are being formed across the land on the basis of avoiding competition with one another. The core at the heart of Coalition Government's NHS reforms is to scrap ALL NHS Primary Care Trusts (PCT's) to be replaced by competing GP Consortia's to directly manage patient treatment commissioning (the process could take 2-3 years to implement). Unfortunately whilst the aim was for better value for money by means of competing consortia's, the implementation is proving to be resulting in the exact opposite anti-competitive consortia's, as virtually all of the Sheffield NHS 92 GP Practices have signed up with one of of 4 geographically located GP Consortia's in advance of the implementation of the Coalition Governments NHS reforms. The flaw in the construct of the consortia's is that there is nothing to suggest that the consortia's and GP surgeries will be competing for patients which therefore means the governments planned reforms will fail and patients could end up with an even worse health services as GP surgeries will be wielding greater power within their geographic constructed Consortia's then they were able to wield under the city wide Primary Care Trust, therefore no competition in GP services will exist and the governments reforms are destined to fail, just as badly as Labours 2002-2003 GP contracts failed as they sent annual GP pay rises soaring into the stratosphere. The British Medical Association (BMA) representing NHS GP Doctors has belatedly gone on the offensive against the coalition government's plans for reforming the NHS by introducing a market for competing GP consortiums to manage most of the NHS £100 billion budget. NHS GP's do not want competition because it would mean a more commercial health service where patients are able to freely move to the better run GP surgeries which risks putting failing GP surgeries out of business and fellow GP's out of work. 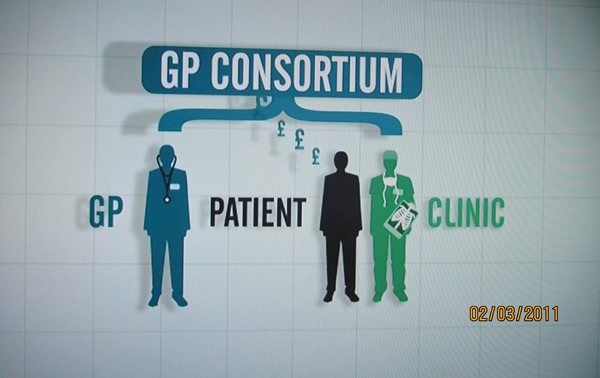 Therefore under a more competitive GP health servicing market as consortia compete against one another for patients, those surgeries that rank at the bottom that prove unable in satisfying and thus retaining patients, should find themselves forced to merge and to restructure with new staff employed so as to ensure that the consortia's are better able to compete against one another for patients. This also means for the reforms to work then there must be at least 2 competing consortia per locality, and preferably more other wise the reforms will FAIL and result in even worse patient health care experience as there will be NO incentive for GP's to treat patients but every incentive to deliver as much as possible of the £100 billion NHS budget into the back pockets of GP's which is probably what GP's expect to happen as occurred following the 2003 Labour GP contracts as illustrated by the below GP Pay graph that contributed to the 2009 MP expenses scandal as GP pay took off into the stratosphere whilst MP's watched on in envy therefore triggering the expenses abuse. The ConLib government appears hell bent on repeating Labours 2003 GP Contracts mistake by effectively giving GP's a blank cheque that is expected to result in huge pay rises as GP's take money meant for improving patient healthcare to reward themselves for working less hours. The Health Secretary Andrew Lansley believes GPs are best placed to understand patients' needs and to decide where money should be spent by funneling as much as £80 billion of the annual NHS budget to groups of GP practices to decide what healthcare services would be purchased for their patients, however the last Labour government tried a similar exercise of empowering GP's that resulted in the exact opposite outcome of that which was intended. When Labour came to power in 1997 average MP pay was £43,722 against average NHS GP pay of £44,000, so both were inline with one another at that time. However as the above graph clearly illustrates in 2003 something started to go seriously wrong with GP Pay which took off into the stratosphere as GP's decided to award themselves pay hikes of more than 30% per annum at tax payers expense that has lifted average GP pay to £130,000 per annum against £64,000 for MP's. During 2011 a Channel 4 News investigation charged NHS Doctors with the subversion of the the coalitions governments NHS reforms to result in NHS doctors pocketing all of the cash saved as a consequence of the NHS reforms, which matches my own analysis of a year earlier that the Coalition Governments proposed reforms were fatally flawed in that they allowed GP's to profit from patient care. The NHS post code lottery which excludes millions from the best health care on offer can only be ended if there is real patient choice, not only for GP's but also hospitals and other health institutions right across the country where treatment is sought which requires real reform of the whole NHS health care system from diagnosis to treatment of all patients . An important element would be to place the power to purchase healthcare into the hands of the patients by means of an NHS Health Credit Card system, that enables patients to purchase health services from any GP practice or hospital regardless of whether it falls under the NHS umbrella or is fully private, so that both patients and health practitioners would be fully aware of the financial transaction involved in the purchase of the health service, which is set against the current system where patients are made to feel that they may be wasting the GP's time so are easily put off by the practiced dismissive attitude of most GP's during initial consultations, which means the medical condition of patients reaches a far more serious state and this proved more costly for the NHS to treat. Patients would have a choice of covered core treatments for illnesses or injuries, where they would have the option of paying to top up treatments with their own money depending on the institution that they seek to purchase treatment from, or for other extra's including IVF etc. This would have the effect of reducing the cost of the NHS whilst introducing greater efficiency into the NHS as the majority of patients would only choose those health service institutions that are ranked as delivering a good service. 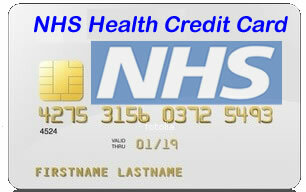 The NHS Health credit card would revolutionise the way healthcare is delivered in the UK, much as supermarkets revolutionised food delivery and choice during the 1980's, as heath supermarkets would spring up all across the country that would maximise efficiency and standardise quality of service delivery as they competed to offer a wider range of health services than anything a bureaucratic top down health care system could ever hope to provide. The health care credit card system could be further enhanced by workers directly contributing to their health care plans that they can claim upon to purchase 'extra' services at a later date, much as workers today contribute into private pension schemes. The impact of this would be to greatly REDUCE the cost to taxpayers whilst at the same time delivering better health services, a win, win outcome for the people of Britain as opposed the current system of an out of control unproductive £120 billion National Health Service that attempts to mask failure to deliver with phony statistics and propaganda of a "free for all service" that does not match real patient experience.